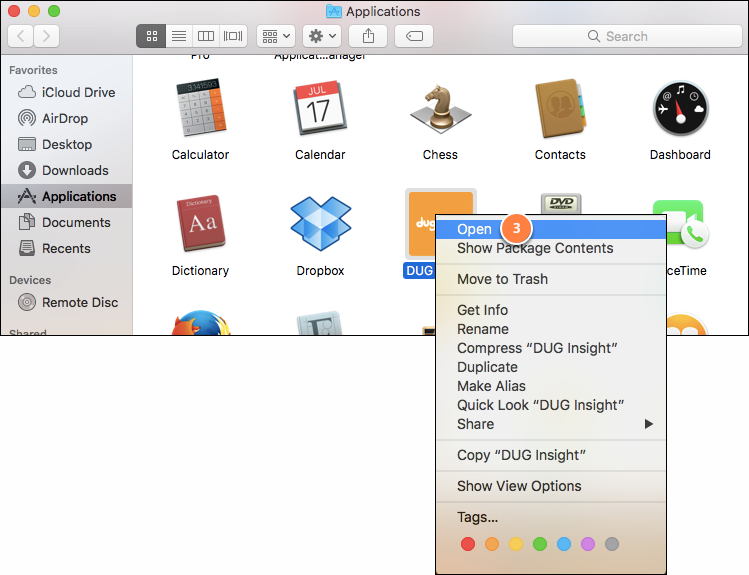 DUG Insight for Mac OS X is a standard disk image (dmg) which is fully self-contained. You can install it to any location and have multiple versions installed side-by-side. Drag the Insight Icon to the Applications folder. Double-click the icon to launch Insight. The first time you run Insight after an installation, you may encounter this warning. In the Applications folder, hold CTRL and click the DUG Insight icon. The warning message will appear again, with a new option to Open the application. Click Open to run DUG Insight. Note: These steps are only required when running Insight for the first time after installing a new version.